Nestled in between the crystal clear calm waters of Smiths Lake, the tropical lush rainforest of Booti Booti National Park, and the Tasman Sea’s sparkling blue ocean, you’ll discover a great little spot called Pacific Palms. 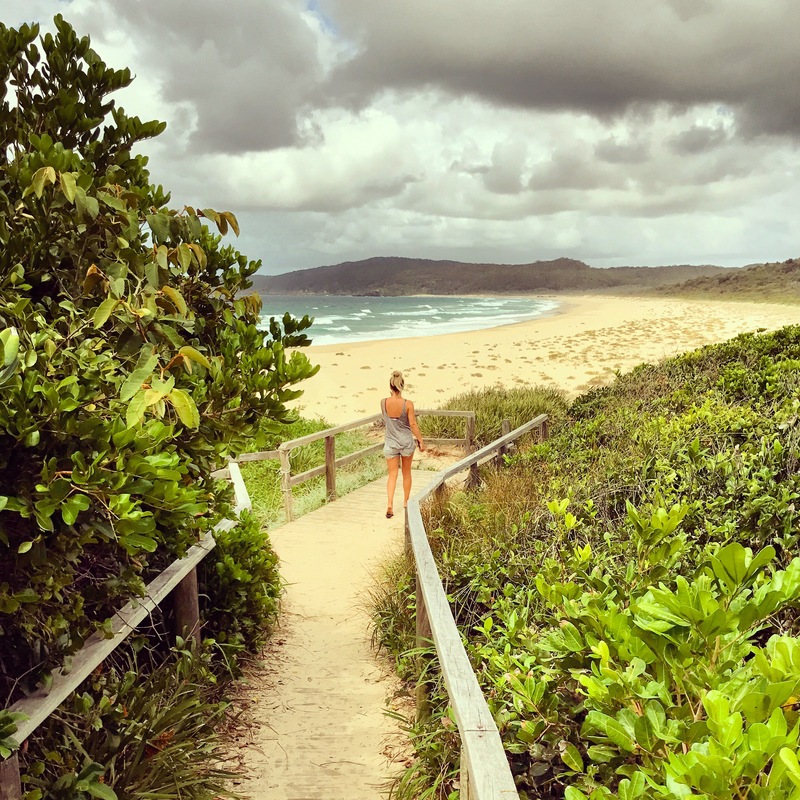 Whilst you could easily spend a week or two exploring the many un-spoilt beaches, sleepy coastal villages, beautiful lakes and national park sights that surround Pacific Palms, being just 3.5 hours north of Sydney it’s also very doable in a weekend. In 48 hours we managed to cram in 6 beaches, a lighthouse, a lake, NSW’s tallest tree, and countless local coffees. We left for our Pacific Palms adventure after work on a Friday, heading north out of Sydney on the M1 and the Pacific Highway. By 8.30pm we were settled into our lovely Airbnb ‘lakeside haven’ overlooking Smith’s Lake. At just $120 per night for 4 people this venue was a steal, and ideally located to explore everything Pacific Palms has to offer. 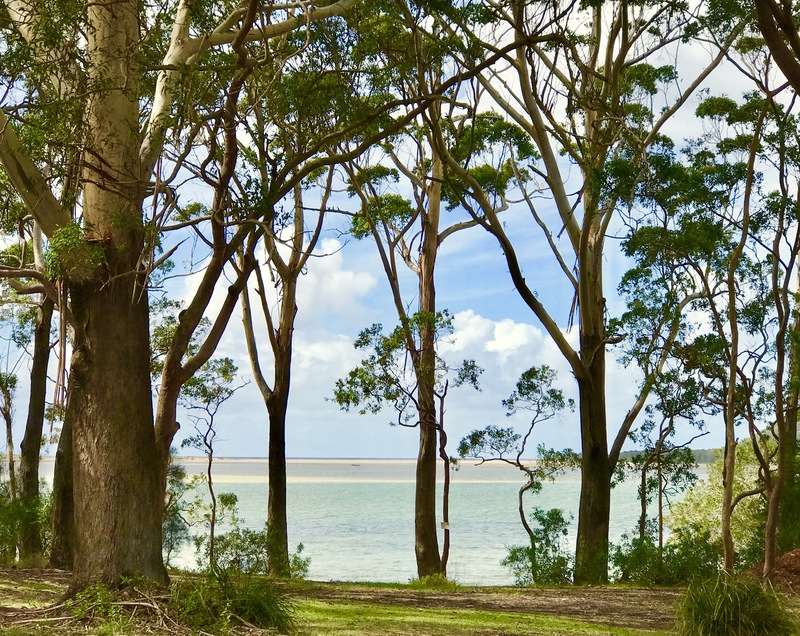 Smiths Lake is a lovely spot, so we began our Saturday morning with a local coffee at Frothy Coffee Boatshed enjoying the views of the lake out on their beautiful deck, before heading 20 mins south to explore our first stop for the day – Seal Rocks. This small sleepy coastal village is a really unique little place as despite it’s popularity, it’s managed to escape being built up into a holiday village meaning it’s retained a lovely local, warm and friendly charm. 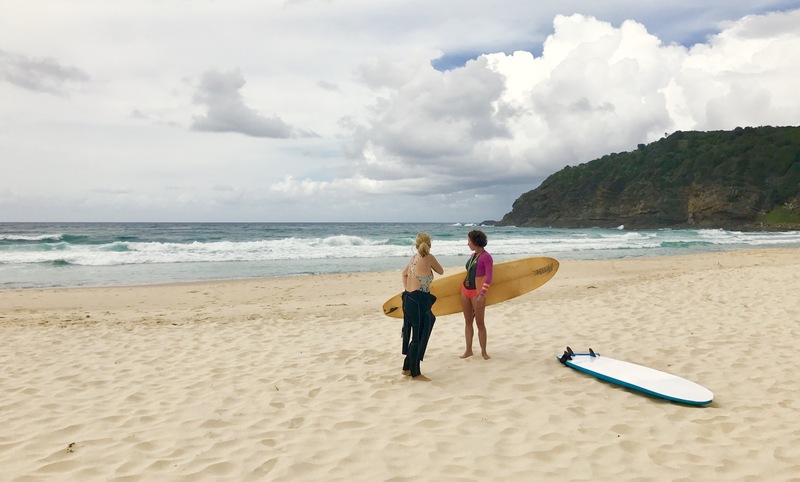 As well as it’s relaxed atmosphere, Seal Rocks is also famed for it’s beautiful beaches (Sugarloaf Bay was our favourite), great surf and it’s lighthouse at SugarLoaf Point. 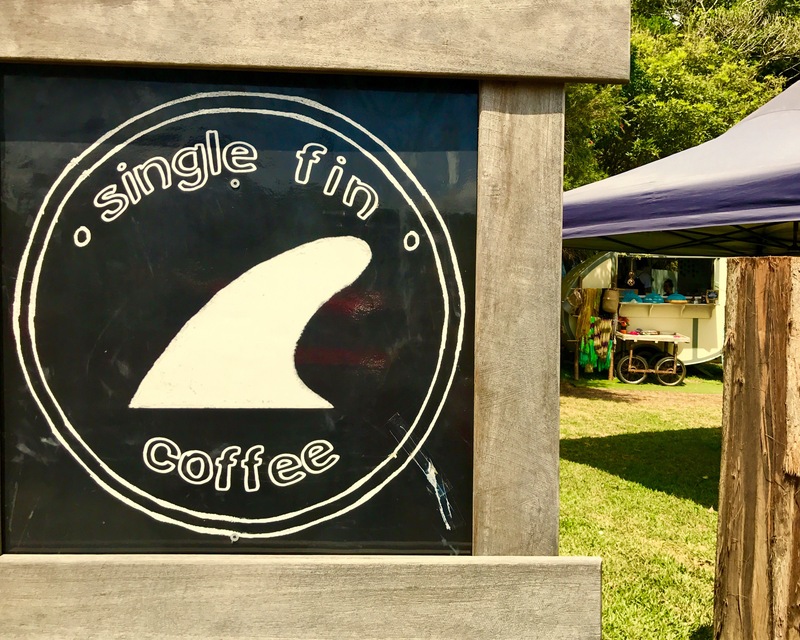 After you’ve taken a dip in Sugarloaf Bay don’t forget to stop off at Single Fin Coffee, just up by the beach car park. Not only is the coffee great but it’s served from a beautifully boho and quirky caravan – very fitting with the chilled out vibes of the village. Once you’ve soaked up the atmosphere of Seal Rocks, head 25 mins north to Elizabeth Bay via Boomerang Drive. 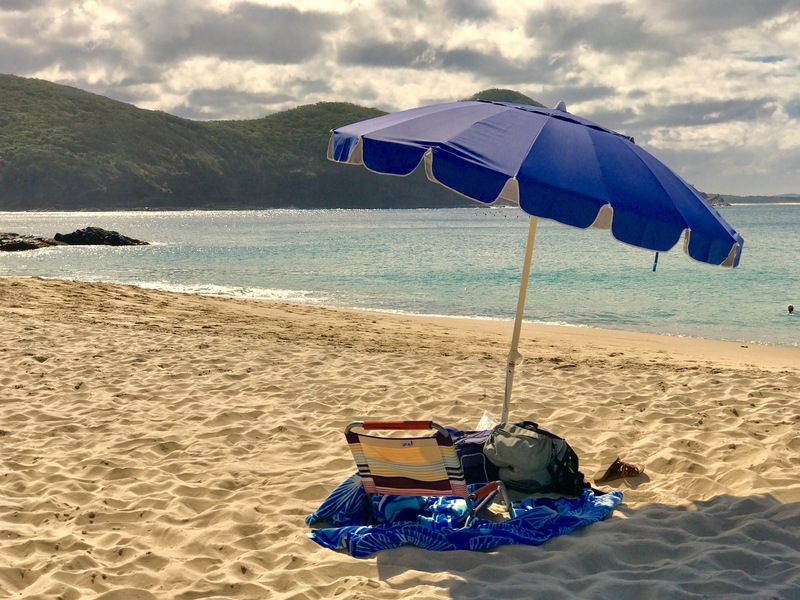 Before reaching the start of the Bay, find a parking spot on the road and follow the bush trail heading east called Shelly Beach Trail. It’s only a quick 10 minute bush stroll and it’s well worth the extra effort. As you look to your left on the trail you’ll start to see the beautiful turquoise Tasman Sea glisten through the trees, before reaching the very inviting entrance down to the beach. 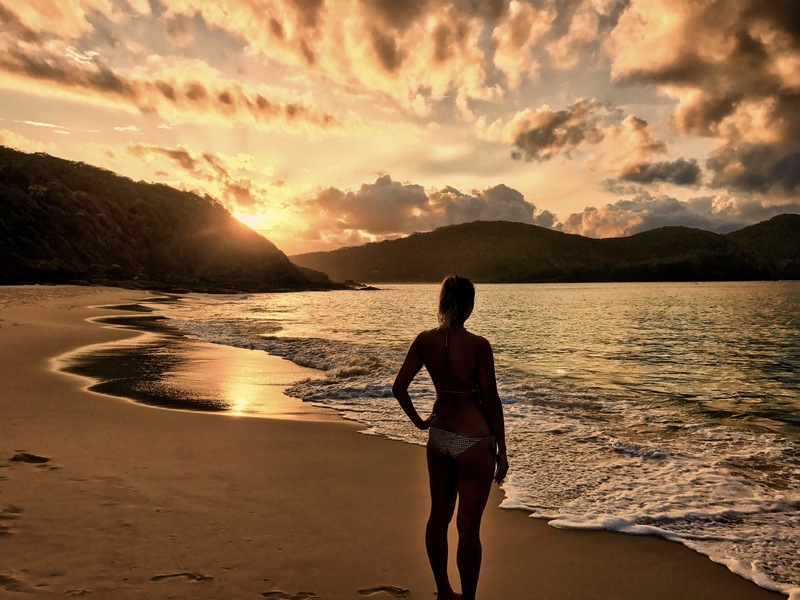 It didn’t take me long to declare Shelly Beach as one of my top three favourite beaches in NSW. Surrounded by Booti Booti National Park and Elizabeth Bay, the water is warm and beautifully still, and being a little bit off the beaten track it’s gloriously secluded. We had planned to fit another beach in that day, but we couldn’t drag ourselves away from this amazing spot so we opted for sunset viewing from here instead, which was absolutely spectacular and worth every second. After a quick breakfast and coffee by the lake the following morning, we drove 10 mins east to check out Cellito Beach. Head down Sandbar Road and park up before strolling down the beautiful 400m rainforest boardwalk to gain access to the beach. 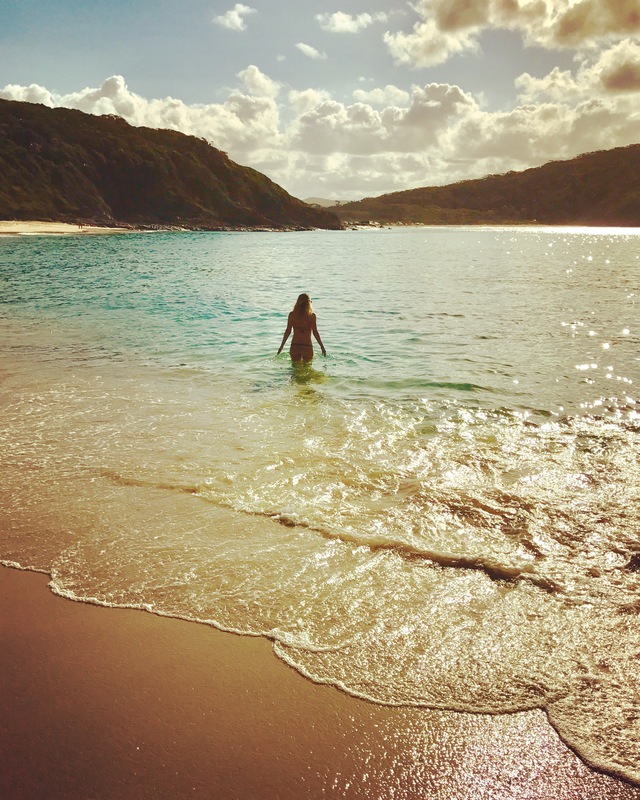 As the rainforest meets the ocean you’ll be greeted with a beautifully rustic view of this totally un-spoilt beach. Just 10 mins north of Cellito Beach is Boomerang Beach and Bluey’s Beach, located in a lovely coastal holiday town with plenty of cafes, restaurants and shops to peruse in between beach hopping. One of our favourite cafes was ‘Twenty By Twelve‘ – a relaxed urban style cafe with incredible organic rainforest alliance coffee. Whilst you’re waiting for your coffee check out their cute lifestyle and homewares shop. Fuelled with coffee, Boomerang Beach was our first stop. Boomerang Beach is claimed Pacific Palms’ best surf beach and is named after it’s actual boomerang shape. Despite the weather turning when we stepped onto the beach, we were quickly cheered up a pod of dolphins riding the waves in amongst the surfers – a really special sight and one we won’t forget. 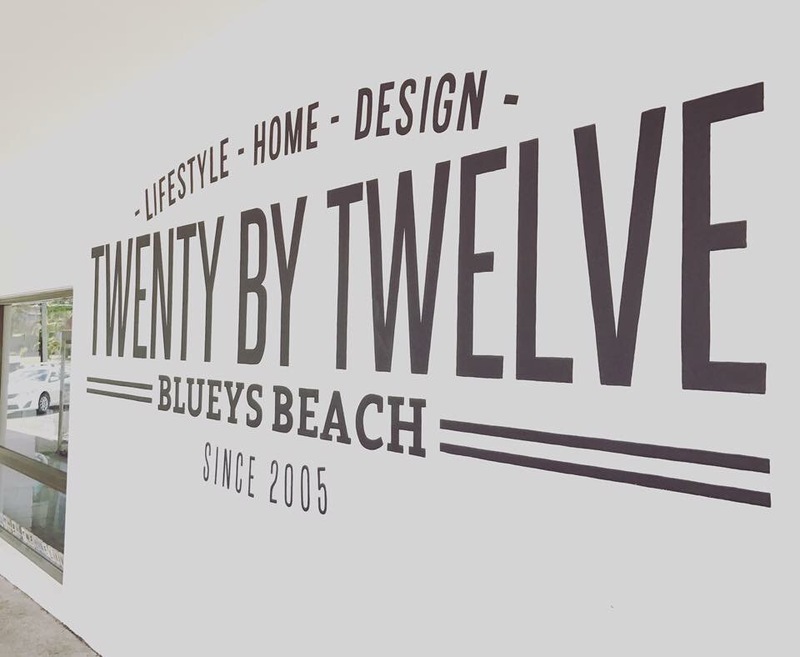 Just next door you’ll find another inviting and picturesque beach – Bluey’s Beach. Bluey’s has some lovely accomodation options and we’ve heard Blueys Beach Shack is a great spot – one to look forward to for our next Pacific Palms getaway. Another big surfing beach, apparently waves are almost guaranteed all year round. 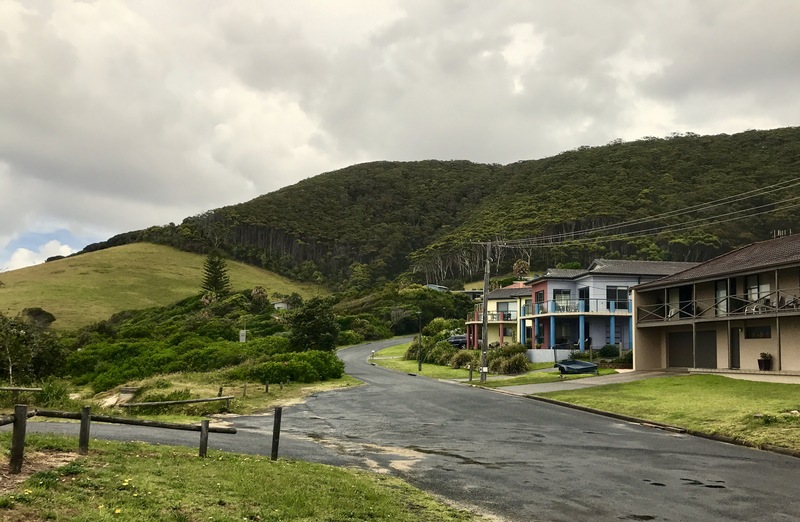 One of our favourite things about Bluey’s Beach is the origin of it’s name – a lovely story of a cows misadventure on a hill leading up to Yarric Mountain on the southern end of Blueys. Not a bad place to get lost if you ask me. Six beaches down, it was time to head back to Sydney. But that didn’t mean the adventure had to stop there – a must do on your way home is a pit stop at Grandis, the tallest tree in NSW. As you head down the Pacific Highway about 35 mins from Seal Rocks, turn off at Stoney Creek Rd and drive for about ten minutes until you see signs for Grandis. It’s well worth the quick detour – Grandis is an incredible 75m tall and 400 years old. If you’ve got a little more time on your hands there’s a rainforest fringed picnic area for a quick bite to eat before the drive home. Pacific Palms is definitely up there as one of our top weekend away recommendations. There’s so much to see and explore, and even though we managed to pack a lot in, we can’t wait to get back and discover all the other great little spots this wonderful place has to offer. We hope you enjoy your piece of Pacific Palms paradise as much as we did. Absolutely beautiful place. Love your pics. This is now my home and it is truly divine. Smiths Lake has a fantastic Butcher, Baker, and organic take away run by a fantastic restauranture, you have to try his duck curry it’s fantastic and you would love our bowling club at Smiths. It’s a great place to chill and best place for families of small children. Kids love the parkdown near Frothy Coffee and the skate board park near the bowling club is great. Thanks for the extra tips Kerry! I’ll check out that take away on our next visit! You’re very lucky to live there, what a wonderful place.